Yay, you decided to start a blog! Now quickly choose one of the 4 million topics that are out in the blogosphere that you want to talk about for years to come. And, make it good because it's what you're going to build your blogging business around. No pressure, right?! This sounds overwhelming because it is. But, don't worry! I have thousands of students in my Blogging to Win Course and I'm going to share with you the top 5 blog niche ideas I see them choose. Want some more specific ideas for your blog niche? 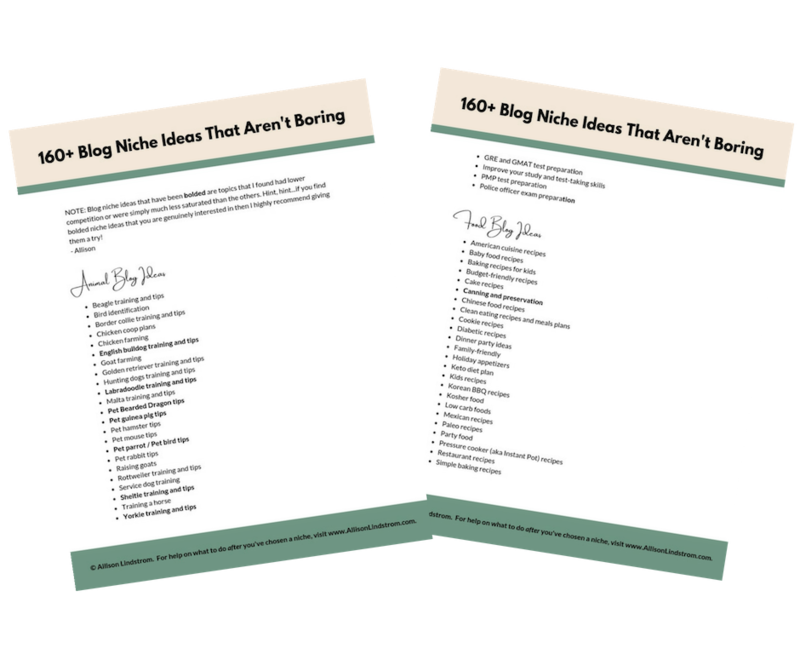 Download the list of 160+ blog topic ideas that can make your site stand out more than the typical “mommy blogger,” “food blogger,” or “lifestyle blogger” sites. When I first set out on my blogging journey, I asked myself, "What should I blog about?" Then, I sat down and made a list of everything that I was interested in. It's a good way to find interesting topics to write about. But there were a lot of things on that list! Can you think of ways to make money on that topic? We are focusing on building a blogging business, not just blogging. That means you need to be able to think of ways you can make money from your blog. Are there products you can create? Affiliates that you can connect with? What could you talk about all day? You need consistent content if you're building a blogging business. Do not pick a topic that you get tired of easily. It needs to be something that you could talk to anyone about anytime. What do people want to read about? I'm not going to lie, there are audiences out there for just about any topic you can imagine. But if you want to make money you need to think about choosing a topic that has a large enough audience that you can keep a steady stream of money coming in. Where did these 5 blog ideas come from? As of today, I have a couple of thousand students that are in my paid blogging courses. I've also had tens of thousands of bloggers come through my free courses and resources. To find this list of five I did some digging to see what these bloggers were writing about. And, I have to say that my members never fail to amaze me. They are so creative! I think it's pretty safe to say that I've seen it all. However, there were some trends. And, while they might have all had different niches with the topics, the five listed above came up time and time again. If you are a blogger that blogs about something else that doesn't fall within one of these five, I'd love to hear about it. You can leave it in a comment below the video on my YouTube channel (and don't forget to subscribe while you're there) or drop it down below. The first category that made the list was food. Who doesn't love food? People love to read about, cook it, eat it, and take pictures of it. All of that makes this one a really popular topic. There are so many ways that you can blog about food. You can share cooking tips, restaurant reviews, or recipes. This is an area that I enjoy seeing all the ideas that my students have come up with. They never fail to put a new spin on things. If you're wondering why that's necessary, check out the section below about choosing a narrow niche. I just love being a mom! It's hands down my favorite role that I've ever had in my life. And, I'm obviously not alone. My bloggers and followers love to blog about their experiences as a mom. I think this is a popular niche because as parents there are so many things we need advice on. When you become a new parent there are about a million different scenarios that you aren't 100% sure how to deal with. Then, every time you think you have your kiddo figured out, they hit a new stage, and everything changes. That means there are tons of directions you can go in with your mommy blog or parenting blog. For example, if you are a mom of multiples you could focus on that. Or if you have a child with celiac disease, you could write valuable content to help other parents in the same situations. The list really goes on and on when you break down ages, stages, and interests. I think now more than ever we are really aware of health issues. We've been educated on what we should be putting in our bodies and what we shouldn't. That makes the health care topic a big one. And, it isn't just physical health, there are plenty of blogs on mental health as well. You could start a fitness blog or a blog for people that suffer from anxiety or depression. Think through the areas of health that you are the most experienced in, passionate about, and would enjoy writing about. How can you use your experience to help others? This is a topic that's really interested to me because I'm a bit of a homebody. Traveling for me usually means one time a year. And, I like to go to the same places and do things I'm familiar with. However, I have some amazingly adventurous travelers in my blogging courses. I just love to see when they start their travel blogs. They talk about all different kinds of things regarding travel. There are some that travel around the world and others that stay within the United States. The world is the limit when it comes to travel blogs. You can focus on far off destinations. Or, you can start a blog for people traveling to your local city. You can share tips on attractions to visit, restaurants to eat at, or destinations that get you off the map. There are a lot of variations when it comes to the self-improvement category. It's a broad category that includes a lot of topics. For example, you could blog about how to overcome failure and fear, time management, thinking critically, or how to be more productive. I do have one warning in this area. From what I've seen, it can be hard to identify what some blogs are about in this topic. So, I really recommend that if you want to blog about self-improvement that you think about what part of self-improvement you are the most passionate about. Don't just decide to be a "self-improvement blogger". Instead, as an example, you could be a "time management blogger". Your blog could be all about sharing helpful time management books, tips on time-management for the morning, the afternoon, and how to teach your kids time management. While you will be discussing a self-improvement topic, everyone who lands on your site will know exactly what it's about. You should need to be really specific. I've noticed that it can be harder for my students to grow their blog as fast in this blog topic. It can go in so many directions that it's really easy to spread your blog too thin covering too many different things. This makes the blog vague. You want to make it 100% clear what your blog is about. Your readers should be able to spot your niche right off the bat. Why is it important to choose a narrow blog niche? There is one thing that you are going to constantly hear from influencers as you work on building your blogging business—niche down. You may find yourself wondering what this even means. Let me help you out. A niche is a specific topic for your business. It's when you take the broad topic that you selected and choose just one part that you are going to focus your blog around. For example, instead of having a food blog, you decide to have a food blog where everything is geared towards moms that are cooking for picky eaters. All of your recipes and tips that you share are written with that niche in mind. If it doesn't relate to moms cooking for picky eaters than you don't put it on your blog. Why is this a good idea? Because it lets people quickly identify what your blog is about. It also allows you to become the "expert" in that area. If a mom with a picky eater finds your site, she's going to keep coming back because everything on the site is useful information for her. People are overloaded with information online every day. If they have to sift through things that aren't helpful to find what is on your blog, they will go somewhere else. Having trouble finding a niche? If you want help on niching down within one of these main topics shared above sign up for the free resource on this page (above). You will have over 160 niche ideas to get your wheels turning! Older PostSomeone Stole My Blog Post or Content. Now What?